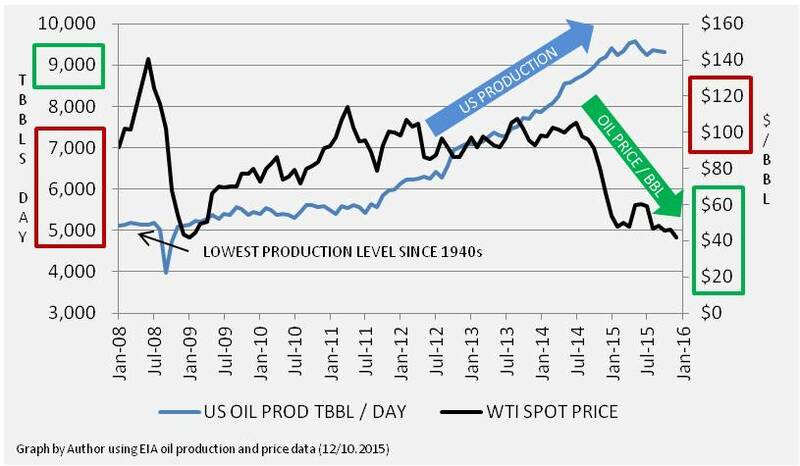 Is OPEC Still Relevant in an Oversupplied, Low Price Oil Market? The world oil market is estimated to be over-supplied by 1.5M BBL/d, yet Saudi Arabia and OPEC continue to maintain higher rates of production. Prices of oil have plummeted since mid 2014 from highs above $100 per barrel to recent lows below $35 per barrel in December 2015. This article reviews the oil supply and pricing dynamics since the Arab Oil Embargo, including 5 other points in time over the past 40 years when oil prices went up or down dramatically. 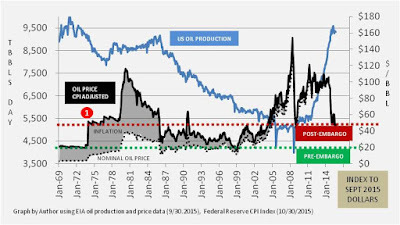 The data reveal that if you inflation adjust prices back to a time pre-Embargo, using 2015 prices, $50 per barrel is currently the point that prices are likely to stay below until over-supply clears. Additionally, market price and supply levels post 1986 provide valuable investor insight into the geopolitical landscape changes required to change the current market trajectory. Market discussion was heated after the December 4, 2015 OPEC meeting about whether the organization was “losing its relevance”. 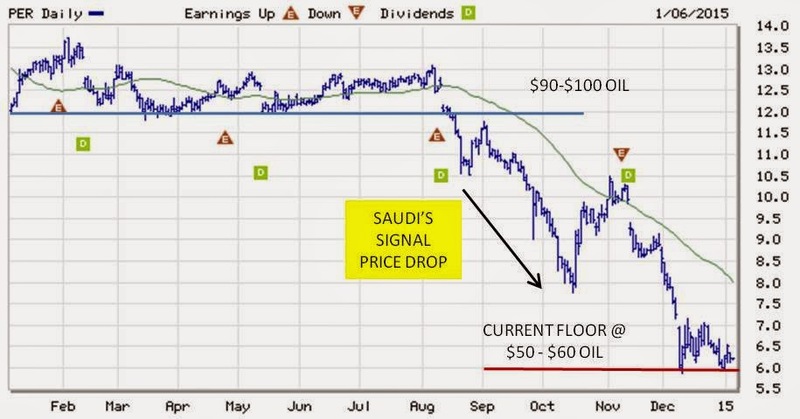 The argument was that since the price of oil continued to free fall after the meeting because the Saudi led cartel did not scale back production to support the price, that somehow the organization had lost its grip on the world oil market. The inability of the group to agree on an official quota left organization members producing at a rate of 31.5M BBLs a day. The result of the meeting was not received well by the market. Subsequent to the meeting the prices of crude dropped below $35 per barrel for WTI and $40 per barrel for Brent and show little sign of quickly rebounding. To understand the relevance of OPEC today, I believe you need to review the history of points in time that the price of oil moved significantly, both up and down. 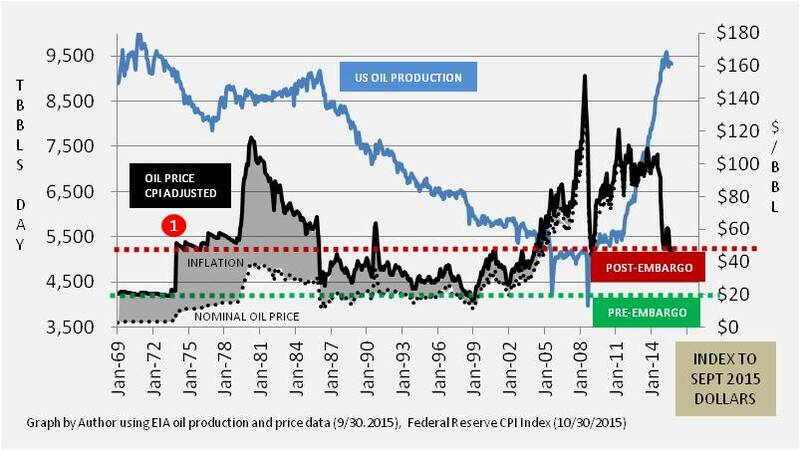 And, since oil is priced in U.S. dollars, the prices need to be normalized for U.S. inflation through time so that changes in the supply of oil relative to demand can be better understood. With this framework in mind, I went back to the point in history when OPEC was arguably at the peak of its power as an organization, the Arab Oil Embargo, and examined 5 major price discontinuity points since that time. The results of the research are shared in this article I recently published on Seeking Alpha. The business model of almost every oil related business has been tested as the dollar price per barrel has fallen from over $100 in June of 2014 to the present $45 price in October 2015. As stock prices of energy sector firms have plummeted, many investors are currently playing a nervous game of trying to call the bottom in the hope of catching upside gains in the event the tide turns quickly. Loading up for an eventual sector rebound may require extreme patience given the level of over-supply in the production pipeline worldwide at the present moment. The tide will turn, but in the meantime, most investors still want to make money. And, like most industry sectors, just because a bear market has set in for the near-term, it does not mean that opportunities in the oil market for upside gains and cash returns are not possible – just that they may be a little harder to find. The current opportunity in the over-supplied oil sector is simple – look for marine based petroleum transport companies like Scorpio Tankers (STNG) which in my opinion is substantially undervalued given the current market dynamics. Why? Export driven oil counties like Saudi Arabia, Russian, etc. have flooded the market with crude over the past year and the excess supply has to go somewhere. Presently the somewhere is primarily China and other Asian emerging market, driven by currency pegs held high relative to the strong dollar and a oil futures curve contango with a favorable low dollar front end price level. The ancillary beneficiaries of this situation are companies like Scorpio Tankers which specializes in the transportation of oil via tanker ships worldwide. And, as the current flow of oil into storage becomes saturated and the North American shale oil business model implodes as it is presently doing, the benefits will continue to accrue to shippers like Scorpio because the U.S. will return to greater dependency on imported oil and related petroleum products. Over the past 5 trading days post the Friday morning October 2nd 8:30 jobs report, investors with exposure to the energy sector have been treated to a major rally. 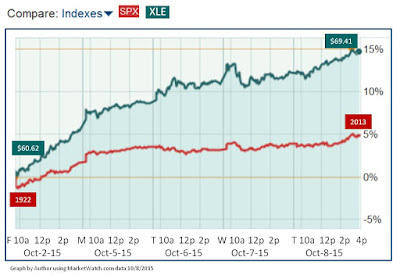 As seen in the graph below, the Energy Select Sector SPDR ETF (XLE) has risen 14.5% from $60.62 at the open on Friday to the closing price of $69.41 on Thursday. Compared to the S&P 500 (SPX) (SPY) aggregate index, which has posted a 4.5% gain over the same period, the out performance of the energy sector is substantial, and worth taking a closer look at to understand what is driving the significant divergence in the returns before diving into just any energy stock at this point in time. If you currently have positions in U.S. equities, you might be interested in the rare and usually ominous signal that was sent by the DOW (DIA) and S&P500 (SPY) at the close of trading on August 31st in 2015. 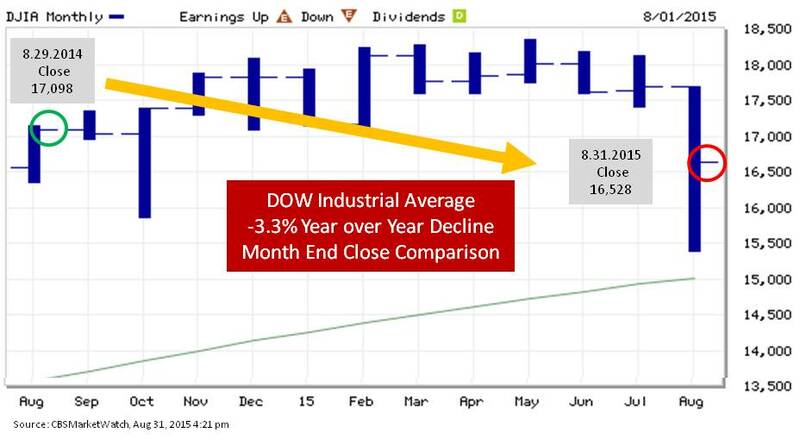 The DOW closed the month of August at 16,258, 3.3% lower than the close at the end of August in 2014. Why is this change in the DOW an important signal for investors to pay attention too? 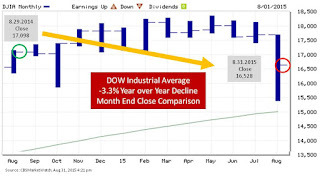 Because year over year monthly changes in the DOW are rare, particularly when the recent occurrence is after an all-time high was set 3 to 4 months earlier. What information is the DOW Signal Sending? Anyone who follows the Financial Market Vigilante blog and has read my book, Theory of Financial Relativity, knows that my research looks at the U.S. financial markets systematically. By looking back through time to gain an understanding of how key market metrics performed during boom and bust cycles, I have developed a heuristic model which investors can use to gauge whether key fundamental forces are strong enough to sustain current stock market index price levels. The model is simple. It contains 7 market variables that are tracked through time. 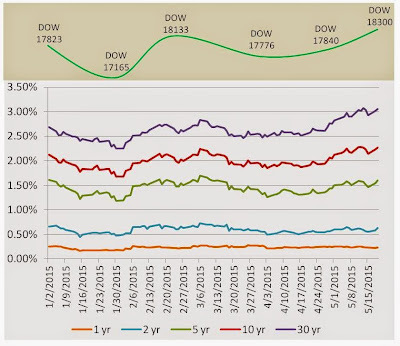 As specific market thresholds are breached, the risk of a DOW (DIA) or S&P500 (SPY) market downturn increases. The model uses quantitative metrics (and one qualitative). To illustrate the stability in the relative value of the market at any particular time, the index variables (shown in the graph below) are illustrated using green, yellow and red markers. Green is considered the neutral or low probability zone for the metric to create a condition conducive to a major market correction. 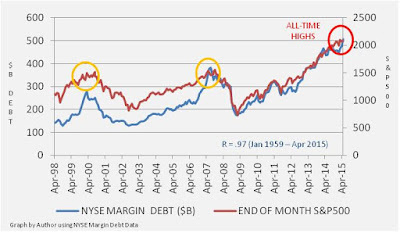 Likewise, a yellow marker denotes a cautionary condition, and red denotes a relative measure that has a high probability of causing downward market pressure. Through time as the measurements change, the directional change in each variable is also assessed and if a variable is approaching, but not yet reached a warning condition, then it is outlined in red. The metrics referred to in the statement are shown in the table below, and augmented by the status of the metrics as of the end of July, 2015. The July month end metrics, which were updated on the Financial Relativity.com website after the July close, included a warning statement for the first time. The warning was “Deflation Driven Correction Risk Extreme”. GDP / Lending Risk - the continued increase risk in U.S. credit markets as loan balances grow to all-time highs relative to the size of US GDP. BAA1 / 30 Year Treasury Spread - a major widening of spreads between the Treasury market and investment grade bonds to historical warning levels. Fiscal Spending Rate - stagnant U.S. fiscal spending yearly growth continues below historical levels and slowed to -0.1% in Q2 2015. Oil Price Levels - rapid commodity price deflation as exhibited in the oil market creates a warning sign on what should be a positive for U.S. consumers. Fed Policy - the tightening of monetary policy relative to the world because other countries are devaluing their currencies relative to the U.S. dollar. All these metrics became progressively stronger headwinds as the stock market pushed to higher and higher all-time highs during the first half of 2015. The fact that Apple (AAPL), the bell weather in the current tech driven bull market, suddenly lost its appeal in the market and recently entered correction territory was a good anecdotal signal that the overall market was entering a correction phase. The stock market relative to GDP (DOW:GDP) has been expensive for over a year, and is now in progress of rolling-over. The recent market pull-back has left the metric in caution territory, but since the momentum in stock price growth is now negative, risk is still high for further declines. Treasury Rates Up, Stocks Up - Will the Pattern Continue? Since the U.S. Federal Reserve ceased its quantitative easing program at the end of October 2014, the stock market has been decidedly more volatile, while also in my view, trading in a pattern that is counter intuitive to many investors. During the QE phase, stocks reacted to the increased market liquidity by catapulting higher, while rates across the board fell. 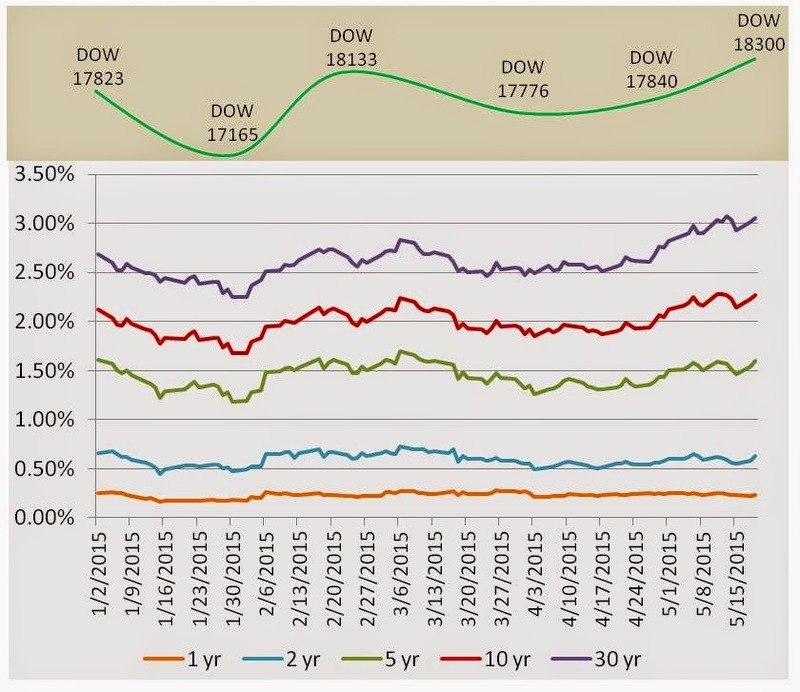 As rates went down, stocks and asset values in general went up. The expected inverse relationship of asset values to interest rates held. The major stock index correlation to the increasing size of the Fed balance sheet is virtually 1 to 1 for the period 2013 through mid 2014. Take away the Fed supplemental diet of steady doses of new liquidity infusions, and as you might expect, U.S. stock returns have struggled. However, they have not struggled as much as many investors may have expected. In fact, just this week in May 2015, the DOW (DIA) and S&P 500 (SPY) traded to new all-time highs. As new all-time highs have been set in 2015, the number of pundits making their predictions of doom in the market seems to get larger and larger. 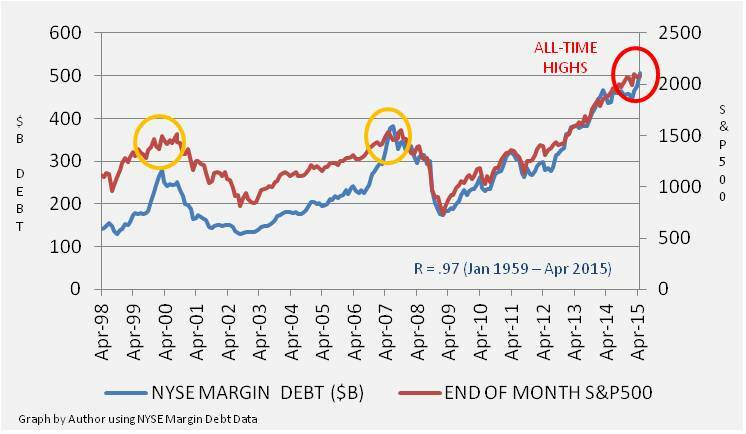 See article: Stockman: Stocks and bonds will 'crash soon'. The 2015 contrary pattern of Treasury rates trending higher since a low reached in January and stocks moving to new all-time highs is very interesting. The more investors worry about the impending doom that the Fed will create by raising short-term rates, or worse drawing down the size of its balance sheet, the more the stock market seems to trade higher. In fact, as illustrated in the graph below, there is a new pattern to which the market is now trading. As you can see in the graph, since the beginning of 2015, each stock market interim bottom has corresponded with a short-term bottom in long duration Treasuries. Each short-term peak has corresponded with a peak in long-term Treasury rates. The current move up in Treasury long duration rates and corresponding move higher in stock prices has not yet confirmed an interim peak, but my estimate is that the May month end close will likely confirm the next reversal point. The trading pattern of the major U.S. stock indices (DIA) (SPY) (QQQ) during since the beginning of 2015 is best described as sideways and volatile. A review of the equity market indices shows the 50 day moving average of DOW and the S&P500 barely maintained a positive slope in the first quarter, while the trading range showed a loss YTD of almost 5% in early February only to recover to a positive 2% by early March, a range of 7%. The tech heavy NASDAQ was a better performer in the first quarter, providing relative gains of 2% for the 1st quarter, and currently up 3% for the year. This pattern is indicative of a market in which stock buyers are increasingly wary of the valuations of large capitalization stocks which are expected to suffer earnings hits in the coming quarters because of a strong dollar, while riskier bets on technology that derive benefit from lower overseas cost of goods paid off. The market dichotomy of technology out-performance while more commodity based industries suffer is not unusual. There are two instances in recent history where the major market indexes were driving to new highs while commodities, and in particular oil, suffered major corrections - the mid 1980s and the late 1990s. The actual market characteristics are decidedly different today; for one neither of these last two points in history had a zero-bound interest rate policy at the Fed. In addition, there is no major technological discontinuity today such as the analog to digital transformation in the 80’s or the dot.com boom of the late 1990s. However, the investment pattern is similar. And the tendency of investors to see relative value in technology over alternatives is evident, not only in the U.S., but also in foreign markets, particularly China (U.S.Dot-Com Bubble Was Nothing Compared to Today’s China Prices – Bloomberg, April7, 2015). Why are market investors currently bidding up the values of technology firms which are characteristically cash burning bets with a few big hit survivors, versus continuing to plow money into the more conservative stocks? 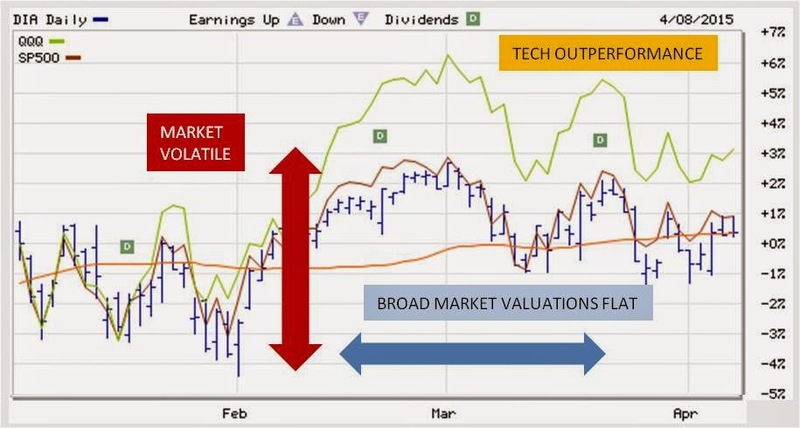 It is within the context of this market scenario that is beginning to play out in 2015 that investors need to continue to assess the likelihood that the U.S. equity market will “correct” from its lofty relative valuation levels before the new tech bets being placed can pay-off. When the zero-bound rate policy was implemented by the Federal Reserve after the 2008 financial crisis, it was readily accepted by investors that the policy was being implemented on the pretense of making monetary policy “easy”. Six and ½ years into the policy, it is becoming increasingly clear that the interest rate policy is best described as “low”, but the term “accommodating” is not a proper way to described the actual policy which has been implemented. After studying his very compelling arguments, it is now more apparent than ever that the current Fed zero bound rate policy (ZIRP), particularly given the extended length of time it has been utilized with only marginal results, is targeted to solve economic problems which in isolation the Fed does not appear to be best suited to solve. The result has been a policy that has morphed into a restrictive monetary policy that is now taxing the mass U.S. market. 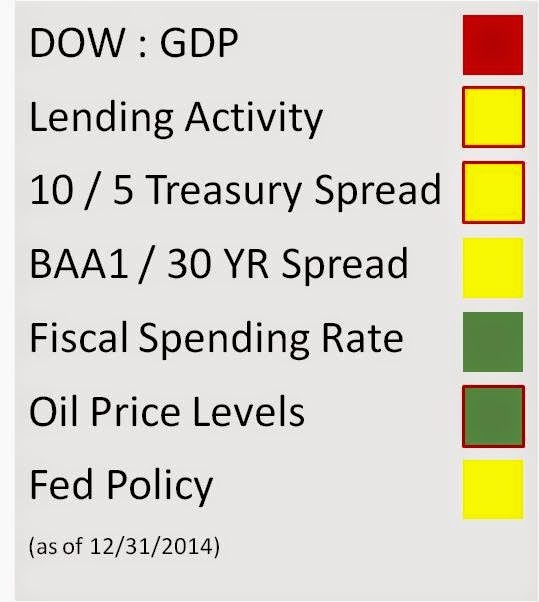 Why is Current Fed Policy Restrictive, Not Easy? The price movement in Permian Trust units (PER) since the beginning of September 2014 thru the beginning of January 2015 has been dramatic, dropping from over $12 per unit settling at just above $6 per unit at the 1/5/2015 close. 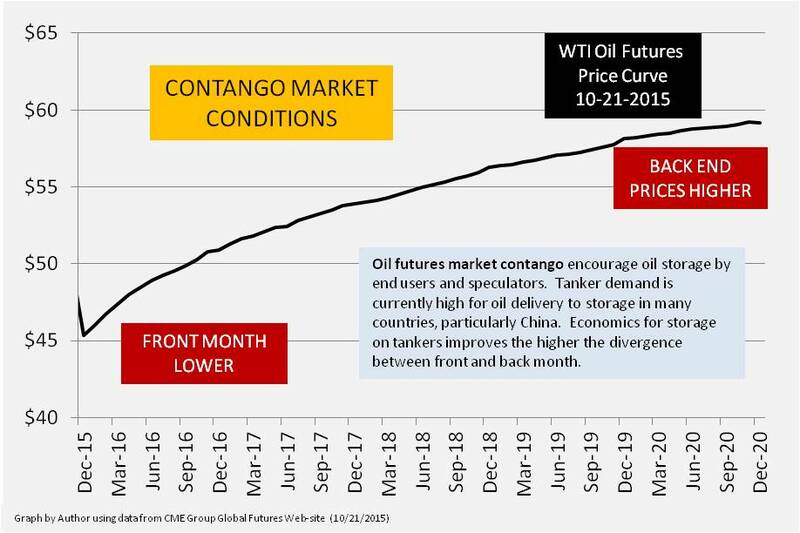 The severity of the move can be traced primarily to an adjustment in the market to a radical downward shift in the expectations for future oil prices. During the summer months as the price of oil spiked up above $110 per barrel on geo-political tensions, the market sentiment was that $100 oil was here to stay, and that there was an implied floor of about $90 per barrel below which spot prices in the market would probably not breech. However, during September rumblings in the industry began to surface that the Saudi’s were going to change the playing field. The resulting “oil shock therapy” reverberated throughout the industry, affecting most severely the drilling services and E&P companies in the U.S. shale oil industry. Permian Trust units, which are heavily dependent on the future price of crude oil, were driven down in traded value because of the expected price shift. The price movement can be visibly traced in the following chart. One of the more intriguing aspects of the chart is the defense of $6 as the current floor as the price of oil has approached $50 on the front month contract. Is this a potential sign that the market is entering a bottoming phase? 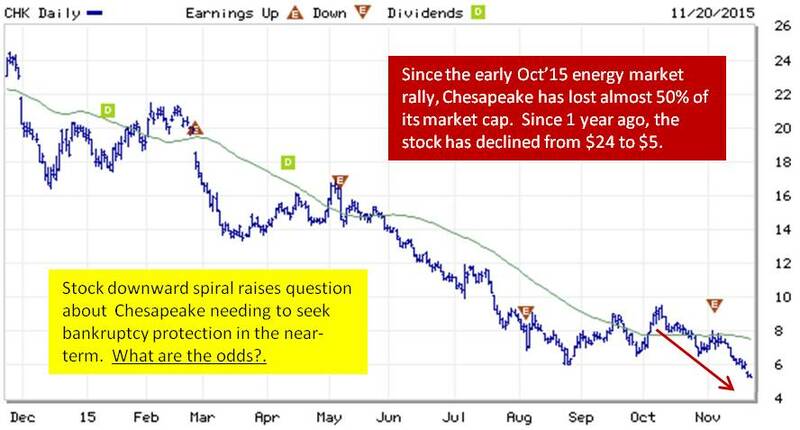 Or, is there another leg down possible, and if so, what is the fair value of the Permian Trust Units if this happens? This report provides insight about the expected change in intrinsic value of the Permian units as the price war continues.